It was all change at the top of our main monitors chart, as we removed a few of the older models and replaced them with some new popular monitors. These inclusions comprised three higher-end models in the Neumann KH 120 A, the PreSonus Sceptre S8 and the Yamaha HS8. A more affordable model from KRK – the RP8G3-NA – also arrived, as did a cool compact monitoring set, the IK Multimedia iLoud. Making ground in the music industry takes a lot of effort. Sure, you need raw talent, patience, enthusiasm and a good ear for detail, but you equally need a range of specialized tools to give you a clear view of your mixes from all angles. Of all the gear found in an average studio, studio monitors are undoubtedly one of the most important pieces. In this article we are going to highlight ten of the best monitors on the market in all price ranges, before taking a closer look at monitors and how to get the best out of them. Let’s get started! A hugely impressive monitor with awesome accuracy. Rich and pure sound from an interesting coaxial speaker. Part of a legendary series, this monitor offers excellent performance. Impressive trebles that reach frequencies higher than almost any other monitor available. A reliable speaker with distinctive style and lots of low-end potential. For the price, this stylish speaker set is hard to fault! Awesome monitor speakers that borrow plenty of solutions from their flagship cousins. One of the best monitors for travel and small studio setups. Offering more real estate in terms of drivers and plenty of headroom. Great performers in the budget segment. Can compete with some mid-range models. Finding its way to the top of our chart, it’s the Neumann KH 120 A – undoubtedly one of the most accurate studio monitors on the market today. Although traditionally a high-end mic manufacturer, Neumann have crammed this stylish and robust monitor full of quality components including a magnetically-shielded 3.25” woofer and 1” tweeter. This all combines to deliver excellent accuracy and an incredibly flat response. Aside from limited I/O connections, it’s a sensational speaker. You pay a considerable price for the privilege, but it’s worth it – as we mention in the full Neumann KH 120 A review. The first of several entries on this list from PreSonus, who are rightly one of the biggest names in studio monitoring speakers at the moment. The S8 features a simple design and excellent build quality, while PreSonus’s proprietary ‘CoActual’ design is very interesting. It features an 8” woofer with a horn-mounted 1″ driver right in the middle for a large and even sweet spot. While this single speaker comes with a significant price tag, the Sceptre S8 delivers a pure sound that’s hard to pass up. You can read more about the PreSonus Sceptre S8 in the full review. From the Japanese brand’s legendary HS Series comes the modernized Yamaha HS8, which will appeal to serious producers and critical listeners of all styles. It features a distinctive design incorporating a clean baffle and white woofer cone, which would look cool in any studio. It also sounds pretty great, with a bi-amp design, an 8” low-end driver and a 1” tweeter combining to deliver excellent accuracy. The I/O and control options are also extensive. We have taken a closer look at the Yamaha HS8 – be sure to check it out for more details on this awesome monitor! ADAM Audio’s A5X series of monitors have created quite a commotion when they first hit the market. To start things off, ADAM Audio isn’t a brand that releases ’affordable’ monitors every other day. We put those quotation marks there because these aren’t really that affordable, which should tell you at which level ADAM Audio usually operates. A5X brings some of their best solutions, including the X-ART hybrid ribbon tweeter that is capable of reaching as high as 50kHz. Low frequencies are handled by a 5.5“ carbon/rohacell/glass fiber driver with enough power to make these sound much larger than they are. Overall, A5X packs some 100 Watts RMS of bi-amped power, making more than capable for most applications. The second largest member of KRK’s Rokit family proves you don’t have to spend a huge amount to end up with an excellent pair of monitoring speakers. 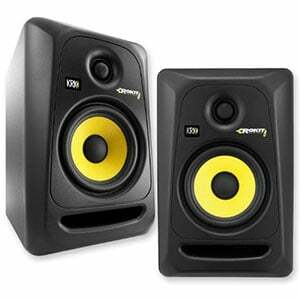 These monitors feature a distinctive and stylish design, with KRK’s trademark all-back cab broken up by the striking yellow woofer cone. This is an 8″ Aramid glass composite cone with a 1” soft-dome tweeter above it, both providing great clarity. Along with 100 watts of power and decent controls, this is a solid set for a wide range of studio uses. Be sure to read more on the RP8G3-NA in the full breakdown! The new leader on this chart comes from PreSonus’s Eris Series – the E3.5, which really sets the bar high for affordable near-field speakers! This stylish pair of studio monitors feature a lightweight construction with an appealing matte black finish, and simple controls. There are 3.5” custom-woven Kevlar woofers offering solid bass and 1” ultra-low-mass silk-dome tweeters for a smooth high end. With 50 watts of power in total there is plenty of oomph from these small speakers, while the overall sound is perfect for home studio mixing and monitoring – as we highlight in the full Eris E3.5 review. Another ADAM Audio design that really deserves attention goes under the name of F5. This speaker is a truly affordable solution from ADAM Audio, which has shown just what kind of integrity this brand represents. They went on and used most of their high-end features, including the now famous X-ART tweeter technology. The really awesome thing about the F5 is how well it works in smaller studios. Its compact size, 5“ woofer cone, and 50 Watts RMS will get you some 106 dB of max SPL you can actually enjoy. That also means that you get enough headroom from such a small speaker cabinet. ADAM Audio F5 is about as balanced as it gets if you’re on the budget. While this affordable set of speakers may resemble computer speakers, they are actually a very versatile pair of travel-friendly monitors that are excellent for studios tight on space. However, their petite design still offers ample power, a clear sound with excellent definition, and a surprising bass response from such a small driver – as we highlight in the complete iLoud review. 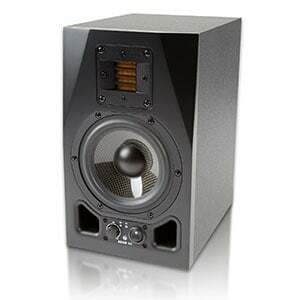 It’s arguable that Eris E4.5 is one of the few monitors that dominate the lower end of the affordable segment. Easy to use and compact, Eris E4.5 have a lot to offer. You are looking at a great balance of power, performance and controls packed into a simple 2-way configuration. Each cabinet is capable of delivering 25 Watts, which is enough to reach 100 dB peak SPL at 1 meter. Being a single amplifier setup, we’re happy to report that the built in crossover works flawlessly. They’re impressively flat for the price, and the fact that they come with room acoustic controls only adds to their already huge appeal. Eris E4.5 is the sweet spot for this family. Last but not least we have a little-known model that has proven to be quite a success. Tascam’s VL-S3 is simple, extremely compact but also powerful. These two-way monitors feature a .5“ tweeter sitting comfortably above a 3“low-frequency driver. In terms of output, a pair of Tascam VL-S3 will get you some 28 Watts of power. While this means you’ll be tight in the volume department, those 28 Watts are plenty enough to take care of a smaller studio. Sure, VL-S3 are bare bones monitors that not many people have heard of, but they will get you the necessary performance to get started. Before we take a look at how to buy and how to get the best out of your monitors, it’s probably worth defining what exactly monitoring speakers are. It can be a little confusing, especially to complete beginners, as a studio monitor can look like your average bookshelf speaker – however, their purpose is completely different. Let’s begin by looking at making music. Creating good music is only half the battle. Making good music sound good on every system out there is the real test of a great producer! This means achieving the same results on a home Hi-Fi system as a car stereo, as consumer headphones, and as a massive nightclub. Why is this an issue? Ultimately it all comes down to speaker bias and how they were set up from the factory. For example, some speakers and headphones are really bass heavy. In affordable systems, manufacturers sometimes like to loosen up the low-end because it gives the sound a bit more girth, while possibly masking deficiencies in other portions of the frequency range. At the other end of the spectrum we have more expensive systems, where each speaker may contain several drivers, each tasked with handling a specific band of the frequency range. Creating a piece of music that will sound good on both budget and premium speakers is not as easy as it seems. This is where studio monitors come in. Look at them as a testing rig. These speakers will be as neutral as possible with a transparency of sound that allows a producer to really hear the nuances of their music, and know exactly how it will sound on a variety of different setups and what needs fixing. These days, ‘transparency’ has become a bit of an abstract term. It gets tossed around without much explanation. An easy way to explain transparency is to use a simple graph. Your vertical axis is measured in decibels (in other words, volume), while the horizontal axis represents the frequency range. To your left will be the lowest frequency that the speaker can reproduce, while the right side is the highest. These types of graphs are made by placing a microphone next to the speaker and recording the output. If we take a standard set of bookshelf speakers and perform this test, chances are you’ll see a positive curve in the lower frequencies, which then dips as it reaches the mids, before spiking again in the trebles. This tells you which frequencies are louder, and which ones are not pushed as hard. With studio monitors, all you want to see is a flat line from the lowest possible frequency to the highest one. That type of flat output is what we consider the definition of transparency, as every portion of the frequency range is represented equally. In practice, having the entire frequency range reproduced at roughly the same volume allows you to notice even the smallest flaws in your mix – such as an instrument that is too loud or too quiet. This is why some beginners, who have never experienced monitoring speakers and such transparency, may conclude that their brand-new monitors simply don’t sound right. However, being so transparent and neutral, proper monitoring speakers often come across as a little bland. Rest assured, this is exactly what they are supposed to sound like – there is no thumping bass, nor those screaming highs. Getting used to this flatness takes some time, however, you will truly appreciate this transparency the moment you finish your first mix and it sounds great wherever it is played. Many people associate power measured in watts with volume. However, power impacts so many other things, which are far more important. Before we get onto this area, let’s take a look at how power is supplied to the speakers. There are two types to note – active and passive units. Active speakers are those that have a built-in amplifier, meaning that they require no external amplification. Passive speakers are the complete opposite. In order to run these, you will have to purchase a standalone amp. In 2018, active monitors are more or less the norm. These speakers will vary in terms of how many power amps are included per cabinet. Generally speaking, cheaper models will only have a single amp to push both transducers. As you begin moving into the higher end of the market, you will find dedicated amplifiers for each transducer. Having a pair of dedicated amps will result in more definition and transparency in the sound, as each amp only has to drive a single transducer. Of course, you can also find high-end tri-amp speakers, with individual amps powering high, mid and low frequencies. Returning to power – if you have a small home studio, 20 watts of power will get you more than enough volume. However, going with a more powerful set is still beneficial as the extra wattage will give you more headroom. This translates to how far you can push the speaker before it starts distorting – having more power will result in less distortion and a clearer, more detailed sound. One of the most overlooked aspects when working with speakers – especially monitoring speakers – is proper positioning. Unlike standard bookshelf speakers, more often than not studio monitors are ‘nearfield’. This means that they produce the best results when the user is just a meter or two away from the speaker (i.e. ‘near’). The further away you are, the less definition you’ll have. So, when you are sitting this close to the speaker, you will need to have them set up correctly for optimal sound. Firstly, ensure the speakers are level with your head and aimed at you. Imagine that a laser beam is shooting from the center of those drivers. You want the beam from each cabinet to be pointed at your head. Next, ensure that the two speakers and your head form an equidistant triangle. This will allow the sound waves from each speaker to reach you without conflict. If you set the speakers too close or too far apart, the sound will become skewed. Another thing to keep in mind when positioning the speakers is the distance from the walls. Most pairs feature bass reflex ports, which are either on the back panel or the front side of the speaker. The issue with bass frequencies is that they propagate in all directions. With rear-firing bass ports, having them too close to a wall will result in those low frequencies bouncing off the wall and back at you. It is therefore recommended that you keep at least 2ft between a reflex port and the wall. Following on from the important topic of positioning is the equally important topic of room acoustics and standing waves. Every room, no matter what size or shape, will affect the performance of your speakers. This is mainly due to the nature of sound waves and how they move through space. Every wave has a length, with higher frequency wavelengths being shorter and lower frequency wavelengths being longer. High frequencies are usually not an issue, since even the smallest studio will usually be longer than the length of those waves. However, as you start going lower in frequency (usually below 300Hz), you will reach a point where the wave is the same length as your room and begins to reflect back. In short, a standing wave emphasizes one specific frequency, meaning you will hear this wave prominently as the reflections reinforce each other. Naturally, this annoying occurrence impacts the quality of the audio and your ability to do your job. So how do you fix standing waves? The best way to tackle this is to place your speakers along the longest wall you have and leave at least three or more feet between the back of the speakers and the wall. If your speaker features room acoustic settings, you can tune the speaker to the size and shape of your room and cut the offending frequency. This can help eliminate the problem of standing waves. Now that we know what monitors are, what they do and how they work, let’s talk a bit about selecting the right monitors for you. Of course, finding the perfect pair for you will rely on a several factors. In this section we will help you determine what exactly you should be looking for! Figuring out how much money to spend on a set of monitoring speakers is one of those decisions that might trouble you for a while (although don’t lose any sleep over it!). You can spend anything from under $100 to well over $3,000 on a pair of speakers, but your current skill, your aspirations and your budget will determine what you should spend. If you are just starting out, buying something in the affordable region – from under $200 right up to around $500 – will be a good call. Even having something under $100 is better than not having monitoring speakers. Ultimately, even the cheapest pair of monitors will fare much better than a great set of bookshelf speakers for a producer who cares about how their music really sounds. Spending anything over $500 for a beginner will probably be overkill until you can really start to appreciate the nuances that higher-end speakers can expose. Learn on something decent that won’t ruin your bank account and you can always upgrade later. Drawing some conclusions from our earlier discussion, finding the right size of speakers is imperative if you want to get the best bang for your buck. However, determining the right size for you relies on a lot of guesswork! Ultimately it is important to consider the space you will be filling with these speakers. If it’s a small studio (around the size of a standard bedroom for example), don’t fall into the common trap of going for the largest set you can afford. In these scenarios, having smaller drivers – no more than around 5” – will give you the sharpest, most defined sound. A bigger studio, such as a basement, will require larger drivers of around 8”. As with any audio equipment – from electric guitars to microphones – there is an element of brand snobbery and brand loyalty among many producers. Of course, when it comes to monitoring speakers, we’d all love to have a set of high-end ATCs or Focals, but that doesn’t mean falling short of these won’t land you with a seriously good sound. Thankfully for the bargain hunters and those on a budget, more and more manufacturers are expanding their lineups to include more affordable models. The key takeaway here is to not dive straight for the first brand you know, especially if you are a beginner. If you are new to audio equipment, you may not have heard of brands such as Mackie or PreSonus, but they deliver some excellent budget options alongside their high-end lines. Can Headphones Be Used Instead of Monitors? This is a great question and one that pops up frequently. The short answer is no – monitoring headphones can’t replace a good set of monitors. Even with open-back headphones that have great definition and an awesome sound stage, you still won’t achieve same results as monitors. Even if your studio lacks proper isolation, or you mix at home and just can’t have the music blasting out the speakers, we still suggest going with monitors at a very low volume. However, headphones are still an awesome tool that certainly do have their place in mixing! In general, it is recommended to mix music on monitors first and then go over the mix again with headphones, as a safety net, to pick up on things you may have missed. You may be surprised at what listening in a different way can expose. Ultimately ‘Speakers vs. Headphones’ is the wrong way of looking at things. It’s not an either/or situation, rather a ‘both’ situation – where using one to complement the other delivers the best results. We have an extensive guide on studio headphones, so be sure to take a look after you have settled on your speakers! We hope we have reinforced the importance of studio monitors for professional and enthusiast producers, engineers and critical listeners of all kinds. We also hope we have answered some of your questions about monitoring speakers. There is a lot more to learn, and there are plenty of articles and videos out there from which to learn specific aspects. Whether you are on a tight budget, or you are looking for something a bit higher on the ladder, the models we have mentioned should have given you some inspiration, but take your time with your decision. You will hopefully end up with the best monitors for your setup, which will prove a powerful studio partner for years to come!